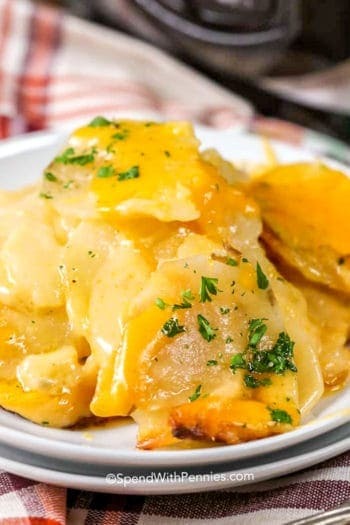 Crock Pot Baked Potatoes is an easy method to cook “baked” potatoes when you don’t have space in the oven! Once you try it, you’ll wonder why you haven’t done it before. 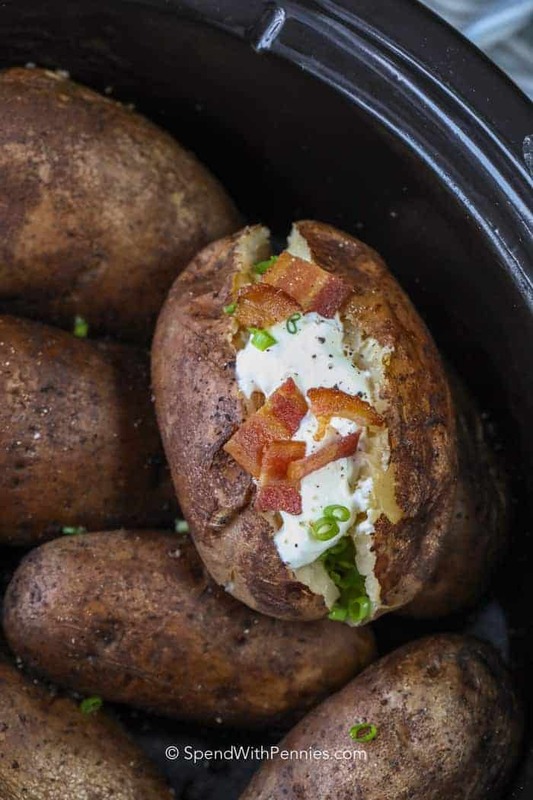 These crockpot baked potatoes are the perfect solution when you want Baked Potatoes but don’t want to heat up the house by having the oven on! 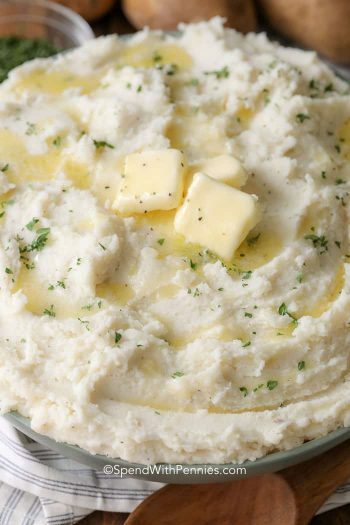 We serve them along side steaks or pork tenderloin but I also use them in any recipe requiring cooked or mashed potatoes! 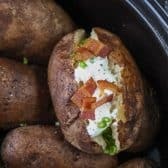 Crock Pot Baked Potatoes? Yes. 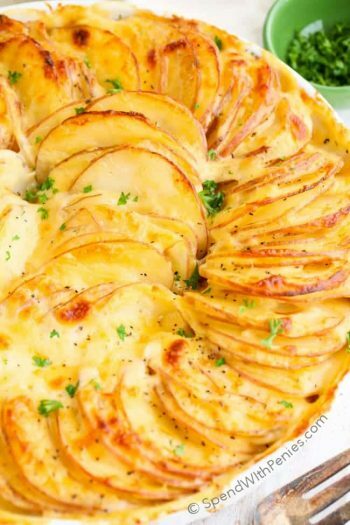 While these potatoes aren’t technically oven “baked” they serve the same purpose and taste amazing! 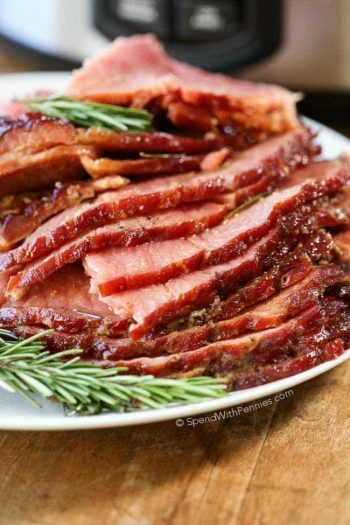 I love these to serve as a baked potato alongside Bacon Wrapped Pork Tenderloin but they’re also great to use in recipes that need Mashed Potatoes as a base! Simply place them in the slow cooker while you run errands and then when you’re ready to make your recipe the potatoes are cooked and ready for dicing or mashing! Voila! 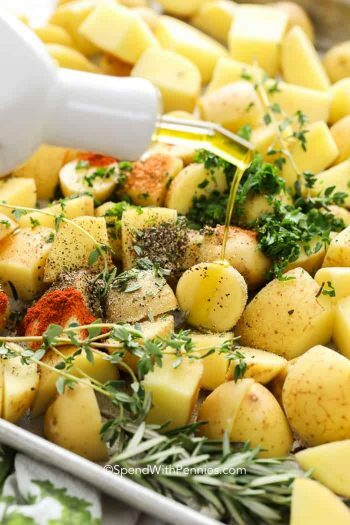 The following recipes require pre-cooked potatoes and these slow cooker baked potatoes make them a breeze. Loaded Mashed Potato Cakes – Family favorite! 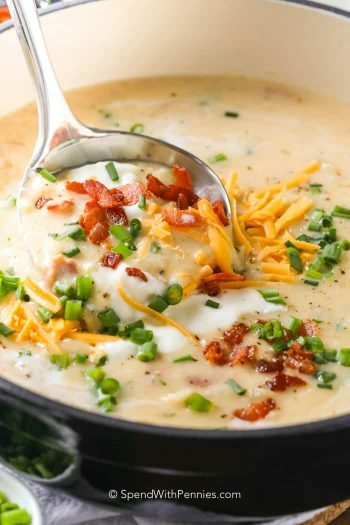 Baked Potato Soup – Delicious comfort food! Some recipes wrap slow cooker baked potatoes in aluminum foil and while you can do that, it’s not necessary. 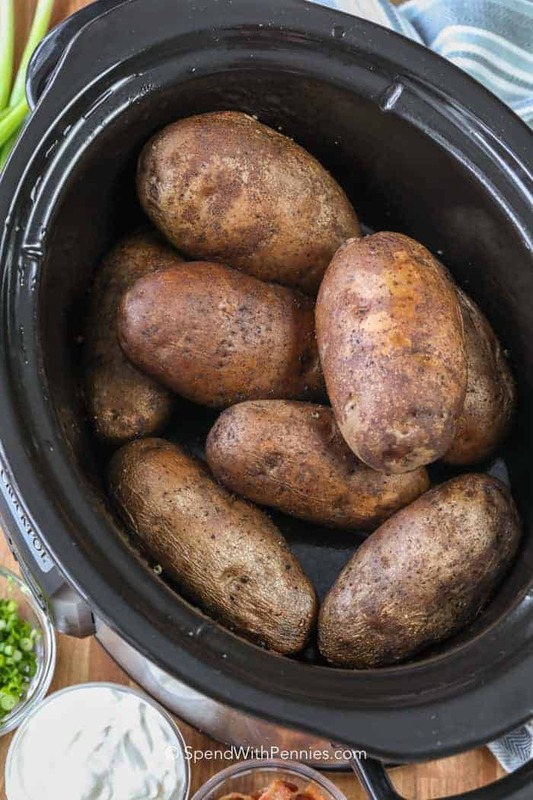 Crock pot baked potatoes cook up perfectly on their own with just a bit of salt and pepper! It’s ok if they’re slightly stacked. Remember that cooking times can vary based on potato size, so just check with a fork if they’re tender. You can leave them on warm for a while but if you overcook them too much, the flesh may discolor a little bit (but they’ll still taste great). How long you cook baked potatoes in the crock pot can vary based on the size of the potatoes. I use 2.5-3 hours on high or 6-8 as a guide and test them with a fork. Once fork tender, they’re ready to go. Once cooked they can be broiled or grilled for a few minutes if you’d prefer a crispier skin! 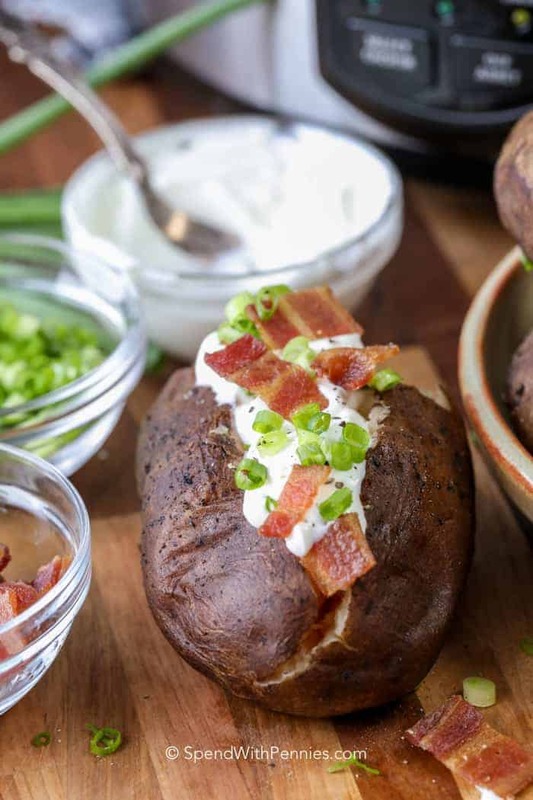 Tender "baked" potatoes made effortless in the slow cooker! Wash potatoes and poke each with a fork a few times. Place in slow cooker (no water required) and cook on high 2 1/2 - 3 hours or low 6-8 hours or until fork tender. If you'd like a crispier skin, potatoes can be grilled or broiled for a couple minutes before serving! Serve with sour cream, bacon bits, chives or your favorite toppings! Cooking times will vary based on potato size. These can be left on warm for a few hours once they are done cooking. Nutrition information based on an average medium sized Russet potato, this will vary based on actual size.